My 1-2-3 Cents : Game On. Will Triple H's Return Help or Hurt? For the better part of a decade Triple H has been one of the biggest players in the game. After winning his first world title in 1999, started on a path of dominance that some could argue still exists today. He's missed some big spans of ring time due to injuries though. Remember in 2001, he was on the shelf during the whole WCW/ECW invasion angle? Then in 2007, he suffered a torn quad that kept him out of the ring for most of the year. Now he's still nursing injuries from the "attack" by Sheamus earlier this year. Now there is speculation that the Game may be coming back to the ring. But perhaps on just a part time basis. His return to the ring is inevitable, especially since he still has a score to settle with Sheamus. The King of Kings vs. the new King of the Ring will happen. It's only a matter of when. Hunter of course is married to Stephanie McMahon. We all know that and how much influence he has backstage in terms of his own story lines and those involving others. Word is, HHH is going to split his time in the ring and backstage. I don't like that idea. I've never been a fan of active wrestlers being on the booking committee or overseeing things backstage. I think most of the time it clouds their judgment. Egos get involved, and let's face facts there are a lot of egos involved in this business. No doubt, Triple H has added to the product during his time in the WWE. He's a dedicated performer. He eats, sleeps, and breathes wrestling. Many will argue about how he got his spot, but I really do feel HHH had proven himself long before he became a "McMahon." But I think he should just stick to the performance aspect for now. I can see him making a solid contribution for a few more years at least. Then he can transition to an office job. Of course, I don't mind him calling the shots and still wrestling as long as another title reign isn't in his future plans. I can already see a squash match against the Miz at Wrestlemania 27. That truly would be disappointing. 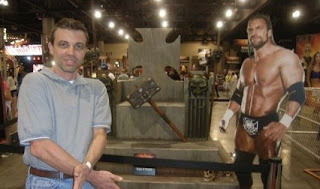 I think most fans miss HHH in the ring and anxiously await his return. I'll be cautiously optimistic before making a final judgment. I get many information about the wrestling games and i appreciate your work.